When you think Calcutta, do you think slums, poverty and filth? Or do you imagine art, joy and beauty? 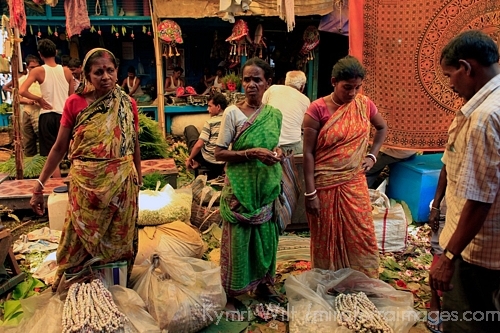 A visitor to Calcutta will see what they want to see, but the camera never lies. It's all there. Open your eyes. ...before pulling out my camera gear to charge batteries, change memory cards, wipe lenses, and do all that not-so-glamorous maintenance work of a travel photographer. So this is Calcutta. Through the window....it looks like a beautiful dream. While it's certainly more comfortable to sit in an air-conditioned room or vehicle watching everything from behind the glass, you'll barely scratch the surface. And it's easy to be bothered by the heat, groaning every time you step out into it and focusing only on how uncomfortable you are. I've seen it happen, I've watched, and listened to, others do this. Three words: Get over it. The people of Calcutta live in this heat every day, with no A/C in their homes, cars or rickshaws. Your body will acclimate, you'll adjust, and you'll be glad you made the effort to accept it and immerse yourself into everything that is Calcutta. To step into a room where knee-high children with big brown eyes hold their arms up to you, longing desperately to be held and carried, and to be told "please don't pick them up" was a real test of my maternal heartstrings. But I found an agreeable compromise by sitting on the floor to read a book while the kids climbed onto my lap and leaned over my shoulders and watched my face as I was able to engage and love them without too much emotional bonding. This was an undertaking not for the weak of heart, and all I could think about was finding my strength in compassion and focusing on the power of love. Pure love. The Mother Teresa kind of love - love for all, and attachment to none. I somehow made it out without adopting a dozen children - although not without shedding a dozen tears. Photography was not permitted in the orphanage and I would have left the camera anyway. Some things are to be experienced with only the widest aperture of heart, not lens. 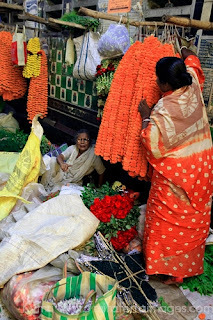 The next day, Calcutta revealed even more beauty than I could ever have imagined, with a visit to the Calcutta Flower Market on the banks of the Hooghly River. I always make a point of visiting local markets wherever I travel, for purposes of both cultural immersion and photographic opportunities. To simply walk through snapping pictures does not the experience make - the photographer must engage all the senses, listening and smelling and touching, in order to capture the image that tells the story. I'm not so sure I succeeded in just one shot, and I really wish cameras were equipped with a scent-mic, in order to record smell. Sound, however, can be shared in a video clip, which also gives a good sense of the pace of activity in the flower market. Now, what the video doesn't show, and the camera can't really capture, is the temperature. It's hot. The outdoor temperature is in the upper 90's (and it's early). As if the heat in itself weren't enough, it's humid too. Like, candle-wax-dripping-wet humid. Now imagine that heat and humidity while under tarps in a crowded space, where you can't walk more than a few steps without brushing, or being brushed by, a hot sticky body of someone else. And there's your sense of touch put into words. Still with me? Good. I spent way more time exploring this market than I had anticipated, and I savor every moment of that experience. The hustle, the bustle, the voices, the sounds, the scents, the odors, the feel, the life.....oh, the life. At times it was like walking through someone's hot tired breath, but with wafts of freesia and roses. 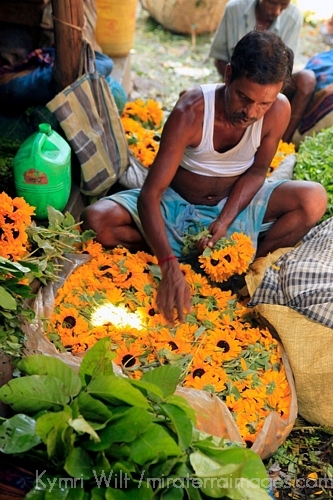 I was fascinated by vendors who spent hours of their market day just sorting and picking through flowers - imagine, doing that for your living. 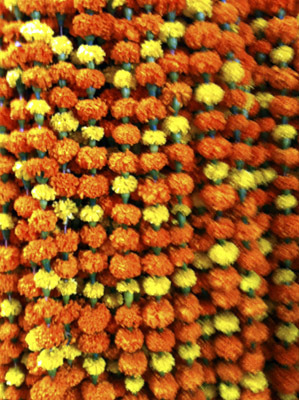 Working with flowers, nature's beauty, and never taking a single one for granted. As it turns out, there are flowers and art everywhere in Calcutta, sometimes obvious, other times, not so obvious. 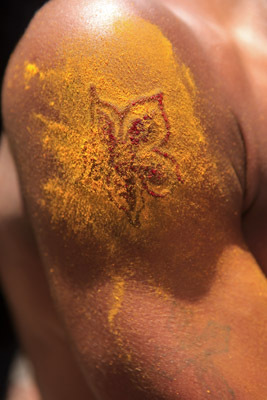 Here, a streetside tattoo artist creates flower tattoos on the arms of a young man, which are then dusted in bee pollen to prevent infection. A trip to the northern quarter of the city called Kumartuli, also known as the potter's village, revealed more arts and more body parts. Here sculptors and artisans work to create clay idols of Hindu gods and goddesses, for use in shrines and festivals all over India...and the world. 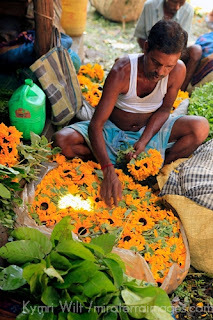 So now, if the thought of Calcutta conjures up images of joy, beauty, and art, then I have succeeded in shedding light on this amazing and wondrous city of India... with my images, with my words, and with my heart and lens wide open. Namaste. Gorgeous photos, great post...I've always thought of going to India, now I know I have to. 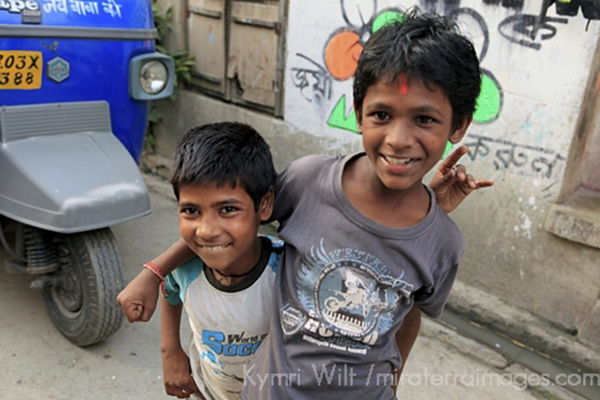 Kymri, you've captured the joy and vibrancy of Calcutta wonderfully! So nice to see a different side to Calcutta. When all you hear about is the poverty, it can be difficult to remember that another side exists. Great photos. Really wonderful post. I'm particularly taken by the one of the sculpture with his reference photo. Beautiful. I agree - you have to embrace India for everything that it is. Your photos are really fantastic! gorgeous photos and I love your words: Get over it! So true when it comes to our perspective of different cultures and cities! Great photos! So much color! And thanks for sharing about the orphanage - what a touching experience!